Looking for the right alternative fuel solution for your 2013 or newer Ford F-650 chassis cab? Choose the ROUSH CleanTech propane autogas fuel system and lower your operating costs and emissions without sacrificing performance. You’ll appreciate the zero loss in horsepower, torque and towing capacity while you save significantly on fuel and maintenance costs. After your dealer places the order with Ford, the vehicle will be built and shipped from the assembly line to one of the authorized ship-thru facilities. It is then placed back in Ford’s transportation system for faster vehicle delivery. Propane autogas vehicles are known for their extended engine life and reduced maintenance costs compared to gasoline vehicles. Propane’s higher octane rating and lower carbon and oil contamination rate not only helps you to save our ‘green’ environment, but saves you ‘green’ at the bank, too. Check out this Savings Calculator that lets you know how much you could save by switching to propane today. Visit the Propane Page for more details on environmental benefits. 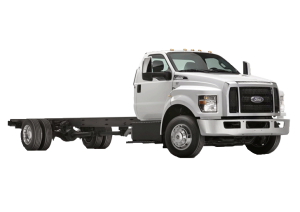 The Ford F-650 chassis cab equipped with the ROUSH CleanTech propane fuel system provides the same great performance, horsepower, torque and towing capacity as the gasoline powered counterpart. In any altitude or extreme weather condition, you can depend on this fleet vehicle to provide reliability and performance. ROUSH CleanTech maintains the factory Ford 5-year / 100,000-mile or 4,000 hours limited powertrain warranty on vehicles equipped with the liquid propane autogas system. The ROUSH CleanTech propane autogas fuel system is covered by a limited 1-year / 12,000-mile warranty when installed on a truck that is no longer covered by the Ford factory warranty. This vehicle can be easily serviced using any standard Ford diagnostic equipment. With a growing network of service centers around the country, and the ability to send technicians out to train mechanics in the service requirements of these vehicles, there is bound to be a service center near you. To find a dealer, visit the Dealer Locator, or call 800.59.ROUSH. By incorporating propane autogas Ford F-650 chassis cabs into your fleet, you will be helping America achieve energy independence because this alternative fuel source is domestically produced. Converting your fleet to propane autogas will also help your company to turn a greater profit by saving you on the bottom line costs of fuel and maintenance. You will increase customer loyalty because your customers will appreciate you providing them with a more environmentally responsible way to receive your products or services. For more information on propane autogas fuel system engineering click here. Measurements based on a Super Cab with 138″ CA. Other cab and CA options available.